Removable wall stickers are the latest items perfect for a room makeover. They are quickly gaining popularity as more people discover how effortlessly and inexpensively wall graphics can transform a wall in a room. They are often made of matte finish vinyl with low nailed removable adhesive. They are quick and easy to put on any smooth surface. You won’t need paint, any tools, nor wall paste. You just peel it off and stick them on. In addition to that, it is very easy to remove and can be position again in any area as it leaves no sticky marks on the wall surfaces. The stickers’ print is of high quality inks that are anti fading and water resistant. With these removable wall stickers, you can turn your room into a sports field with baseball or football designed decals. You can also turn your room into a jungle with decals printed with all the wild animals for an imaginary adventure in the forest. For those who love Pirates of the Caribbean, there are also pirate mural stickers that can twist the entire room into a big ocean with big pirate ships and pirates on the lookout for their treasure. For those who still haven’t found Nemo yet, stickers designed in underwater world are also available to continue the search. And if you are not yet over with Disneyland and it’s princesses as well, you can bring them in your very own room with just these decals. You might just want to experiment putting on these items if you want to decorate your walls with movie themes. Blockbuster hits such as Moulin Rouge, Titanic and many others can line up in your wall to achieve that style. At this instant, you can achieve that room environment you always wanted. You can even add your personal flare to your wall décor as you can customize the prints you want for your wall. 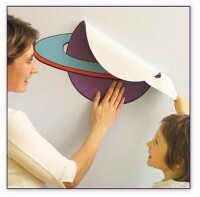 Furthermore, these removable wall decals are just as good as painted walls. As a plus, you are free from the hassle of repainting because they are easy to remove and you just have to pick another design if you want to change your room theme. A removable wall sticker is a good surface art items that will give you not only the fun but also the excitement in wall decorating. Surely times have had come a long way to bring us these easy to use fashion article.